Glass plays an essential role in medical equipment — especially inside X-ray detectors. These medical devices require a specialized glass composition to ensure the material withstands extreme heat and energy, as well as repeated applications of radiation technology. Endurance to high transition temperatures. Low thermal expansion to maintain dimensions under the stress of construction and operation. Pristine surface quality and flatness for the best quality images and highest accuracy. Of the many glass options available for medical devices, BOROFLOAT® glass is one of the best choices. While general glass absorbs radiation and deteriorates, BOROFLOAT® glass is not easily changed by high-energy radiation, and is therefore not as susceptible to darkening, as seen in the photo below. BOROFLOAT® glass is also extremely versatile, and can serve as a scintillator substrate, cover slip, protective window for X-ray rooms, and many other related applications. At Swift Glass, our customers in the medical device industry count on us for fabrication to their specification. We partnered with BOROFLOAT® glass manufacturer SCHOTT to put together an educational white paper, BOROFLOAT® Glass in the Medical Industry: How It Resists Radiation’s Effects. 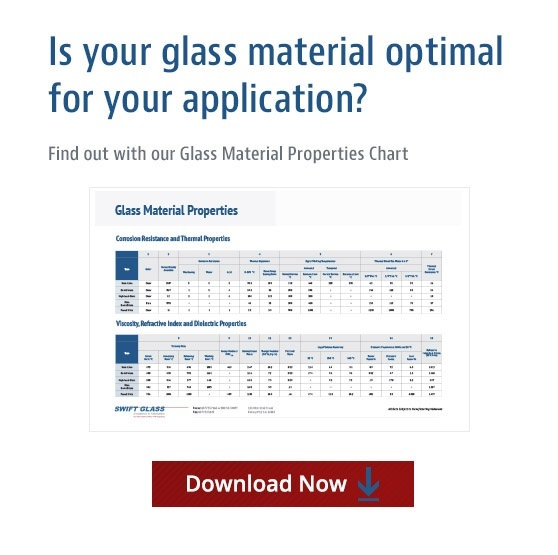 This technical guide further explains the unique construction of BOROFLOAT® glass and its sizes, thicknesses, and tolerances in which it is available. Take a look at our guide today, and please contact us directly if you have any questions or would like a quote.